The images of women in chadors or burqas as contrasted with images of belly dancers which circulate today as representations of Muslim/Middle Eastern women do not fluctuate from the images propagated by Orientalist paintings and colonial photographs which also offer contrasting representations of the veiled thus secluded and the naked or semi-naked thus eroticised Muslim/Oriental woman. As well as challenging the prevailing stereotypes of the Middle Eastern and North African women, the book aims to highlight the element of diversity which characterises the lives of these women and the regions to which they belong. The sense that most of the Middle Eastern and North African countries are Muslim does confer a common identity, a distinction from others that may serve to bridge wide social, cultural, and economic differences among them. However, it is also important to stress that significant elements other than Islam contribute to the making of MENA societies and women’s cultural identities. 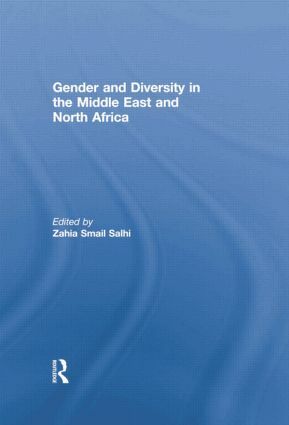 This book was published as a special issue of the British Journal of Middle Eastern Studies. Zahia Smail Salhi is Professor of Modern Arabic Studies, at the School of Arts, Languages and Cultures, The University of Manchester.